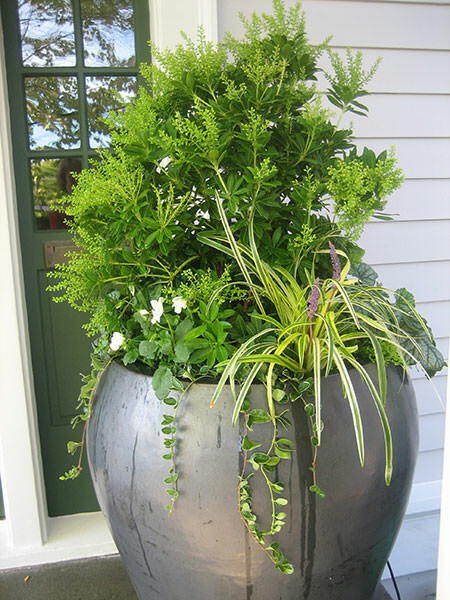 Below you will find many fresh planting ideas for your containers. 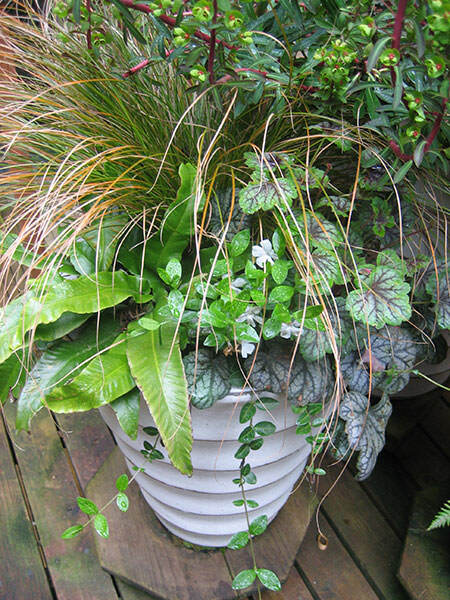 Garden ideas for winter containers use a mix of dramatic foliage. 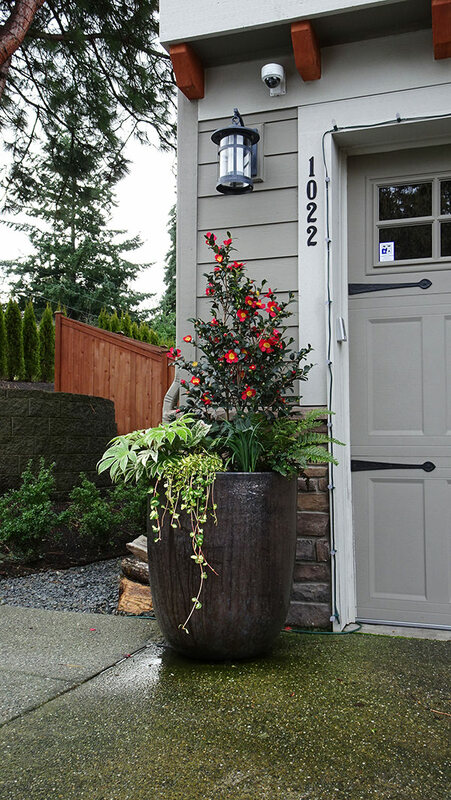 Camellias work well in outdoor planters and provide winter color. 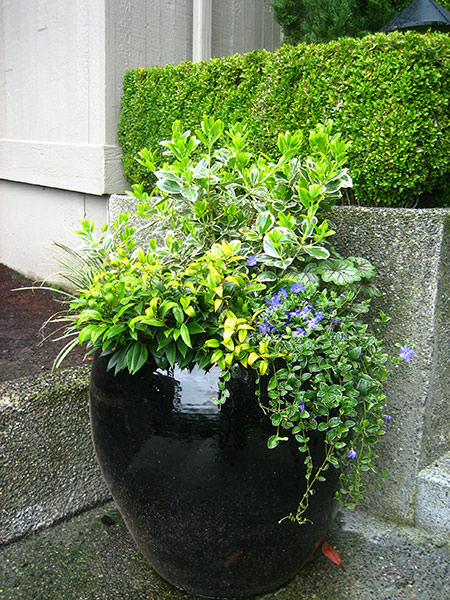 Fall and winter container planting ideas should rely more on foliage than flowers in the Seattle area. 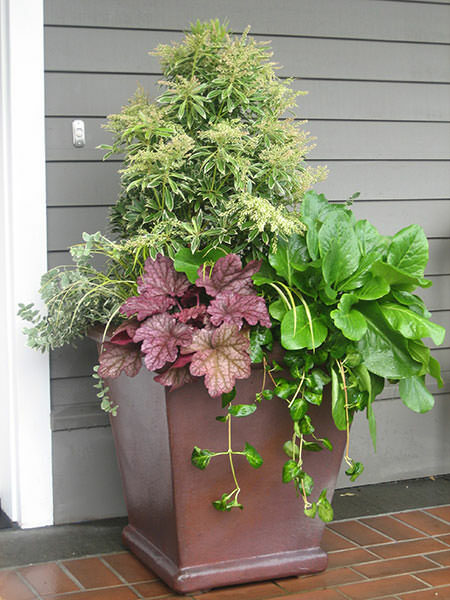 Container planting ideas for fall/winter include interesting foliage perennials that bloom in late winter/early spring. 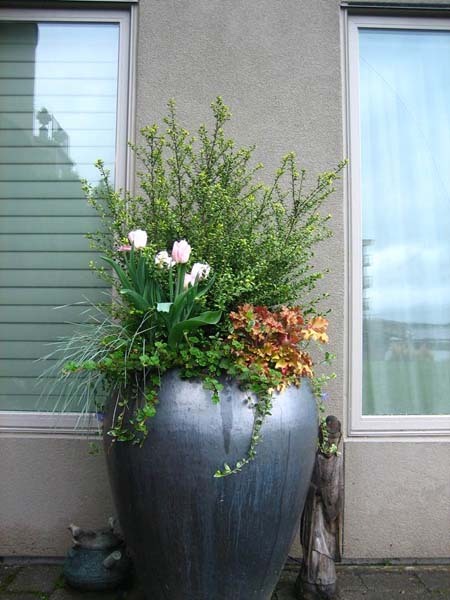 Large container gardens can include a selection of bulbs, which are some of the best flowers for containers in the winter. Hellebores, bulbs and early-flowering perennials are great container planting ideas for cold weather container gardens. 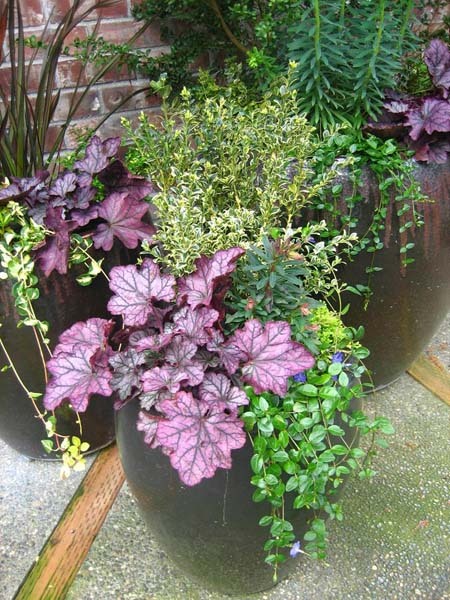 A purple Heuchera and variegated foliage plants unify this large container garden. 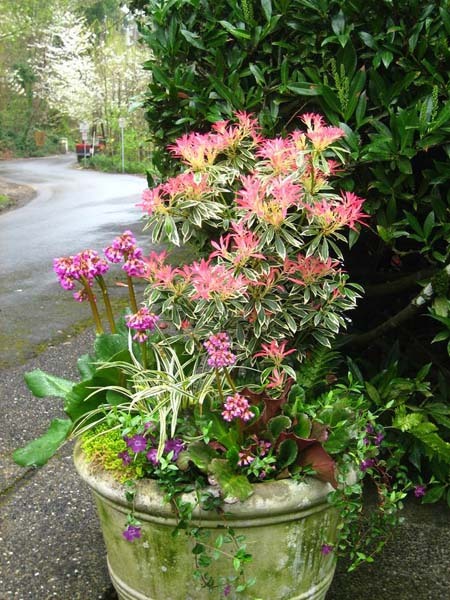 A flowering Pieris and contrasting foliage plants make this fall/winter container as interesting as any beautiful flower pot. 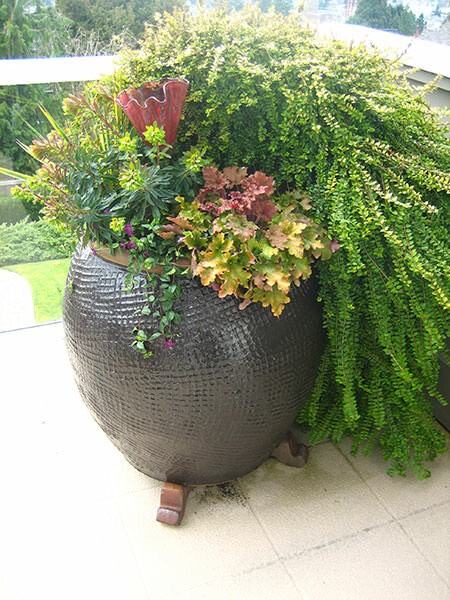 A large container garden repeats foliage colors and shapes. 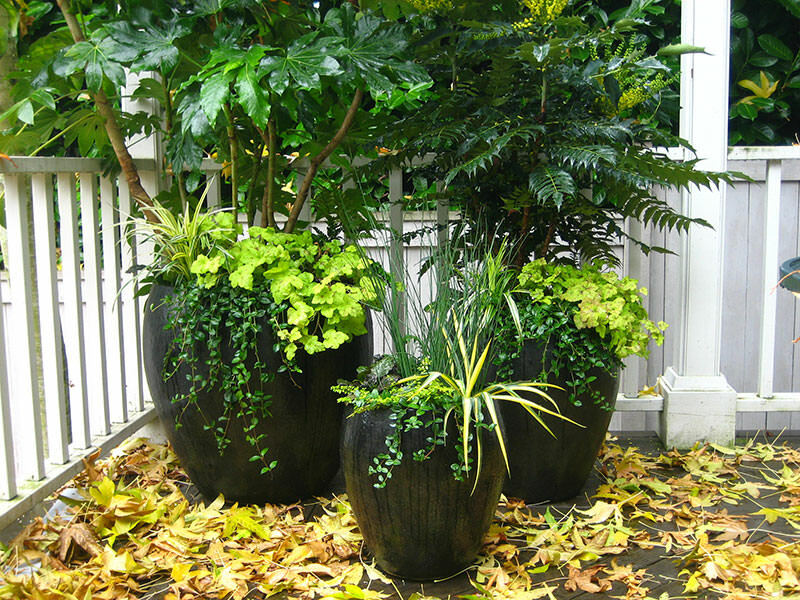 Grasses, ferns and evergreen groundcovers are mainstays of fall/winter container planting ideas. 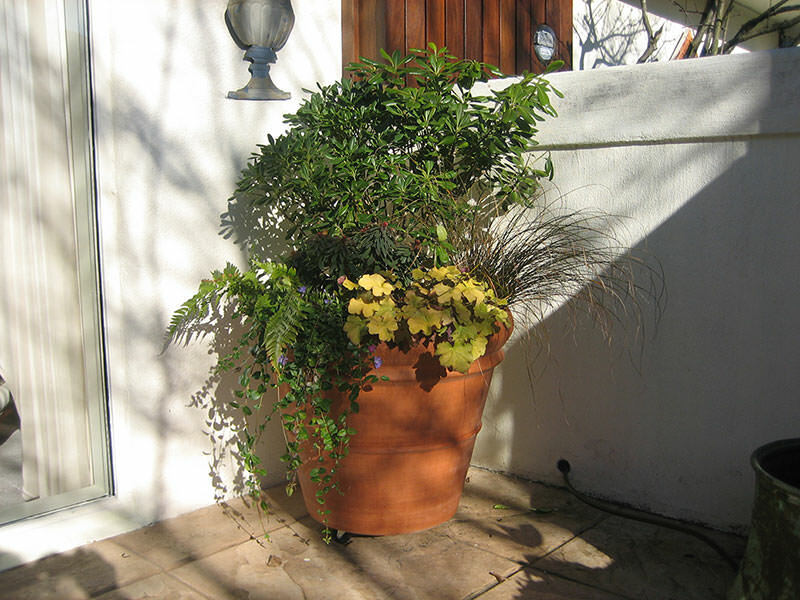 Large container gardens do not rely on flowers for winter interest. 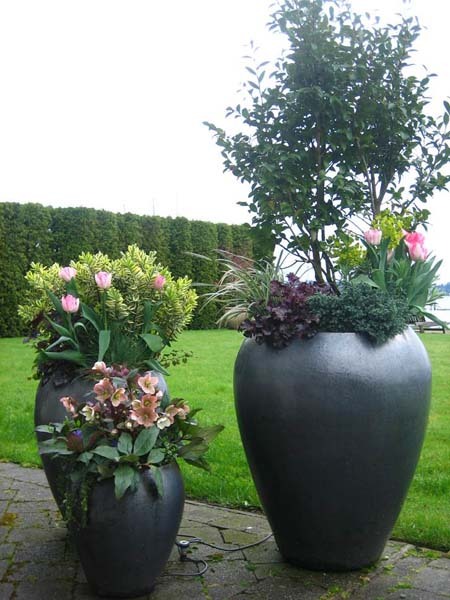 Tall planters mirror the vertical height of an arbor. This is one of many container garden ideas that feature Helleborus blooming with white flowers. 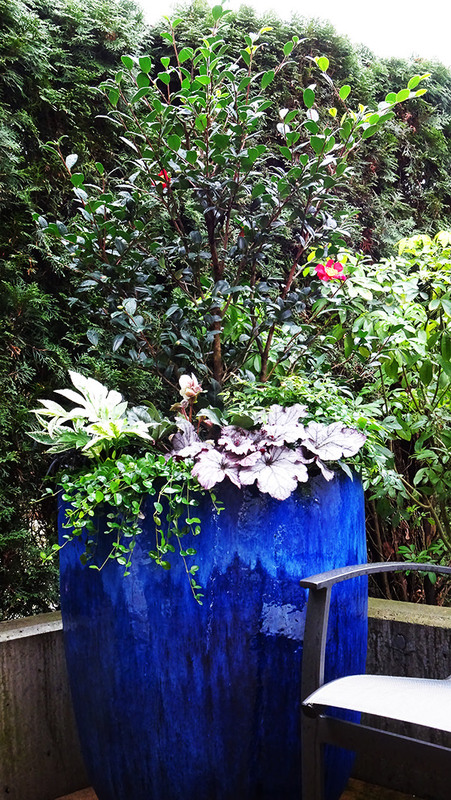 The striking blue of this outdoor planter reflects the colors inside this client’s home. 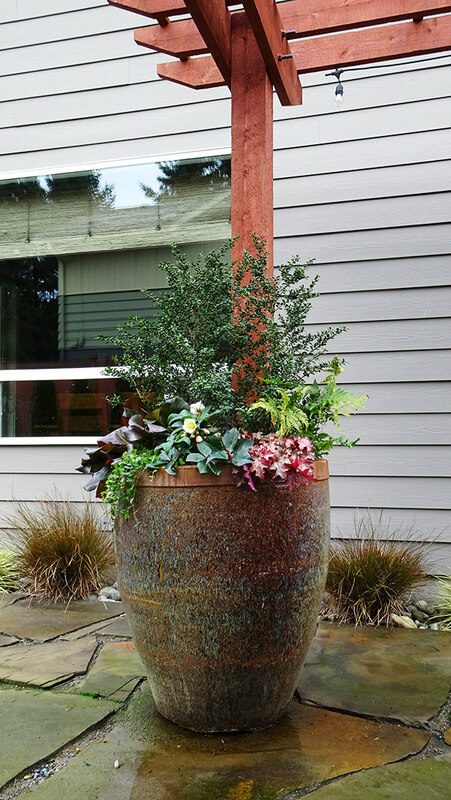 There’s more to enjoy during fall and winter if evergreen plants are incorporated into a large container garden. 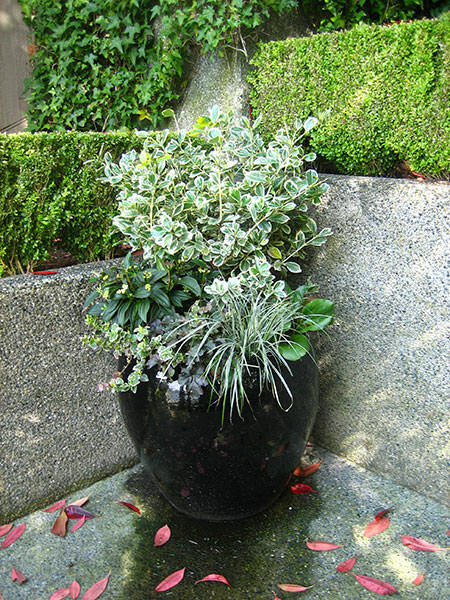 A touch of glass art in this container planting idea reflects the foliage color. 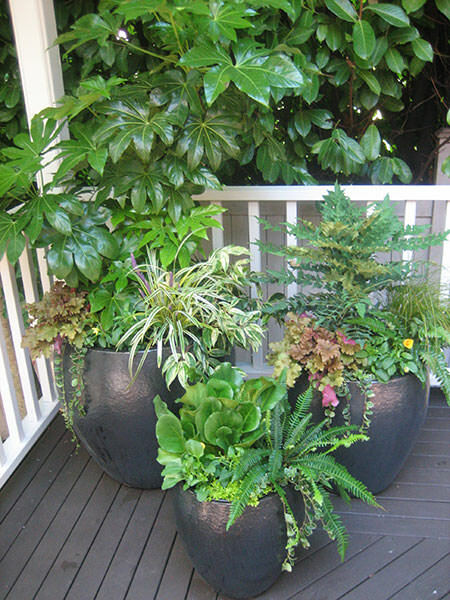 Beautiful flower pots don’t need to contain any flowers at all in the winter in order to sparkle. 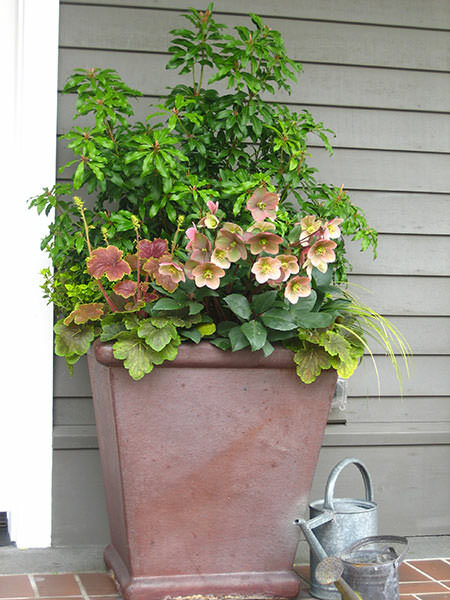 Golden-brown grasses and amber foliage pick up the warmth of the terra cotta container in this fall/winter container planting idea. The best flowers for containers in the fall and winter container plantings may be our winter-flowering Hellebores. 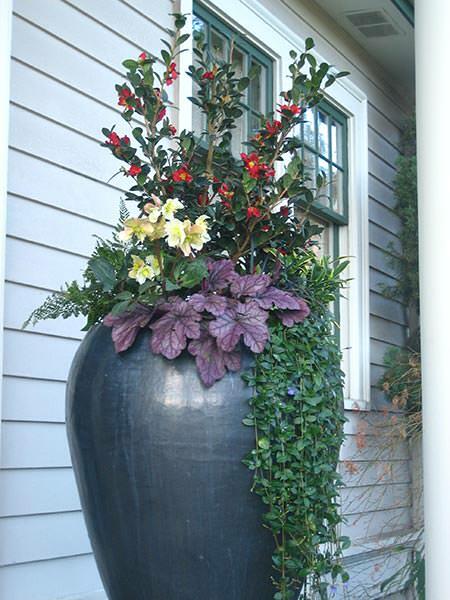 Contrast and movement are reflected in this container planting idea. 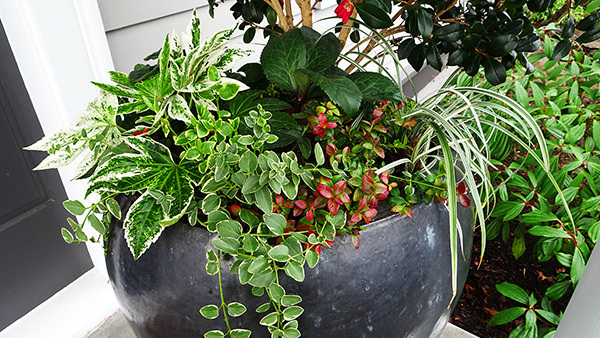 Variegation unifies this fall/winter container planting idea. Golden foliage stands out on a dark winter day. 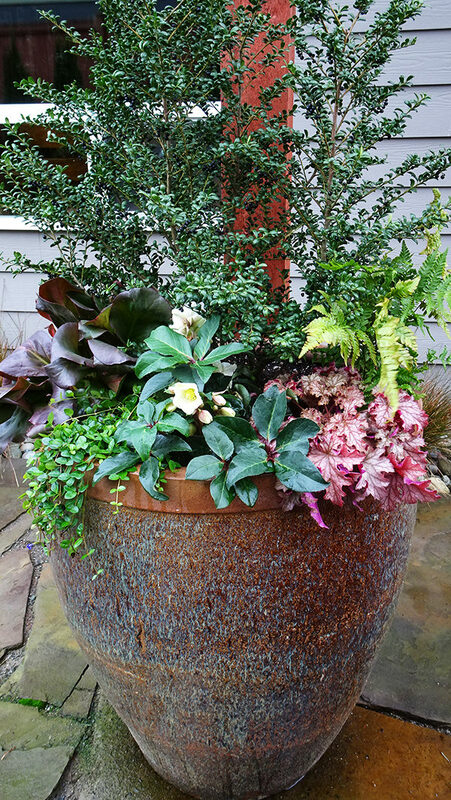 Repeating foliage colors ties this large container garden together. 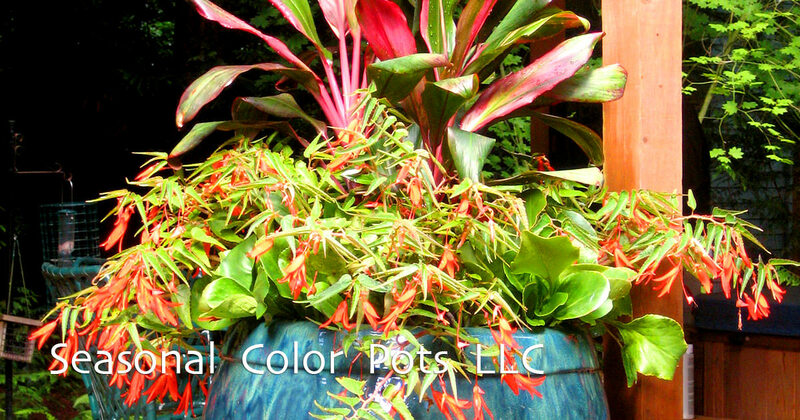 The red tips of the Bergenia leaves reflect the color of the large container and the tree foliage in the background of this patio container garden. 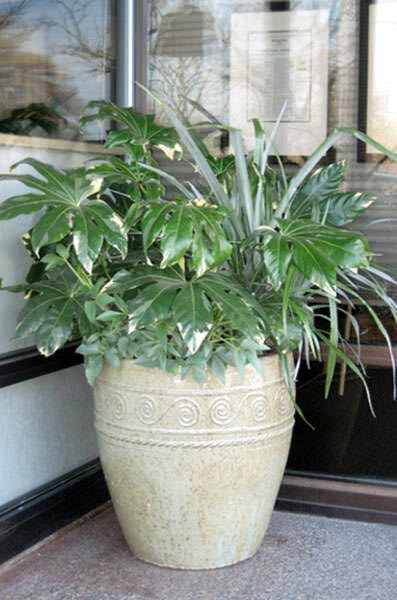 “Toni has designed, planted, and cared for our condo deck pots for over 10 years. The plantings have been challenging as we have north, west, and south facing decks on the 12th floor of a condo building which are all exposed to varying levels of sun, temperature and wind. She has done extensive research to find just the right plants to survive on each deck. 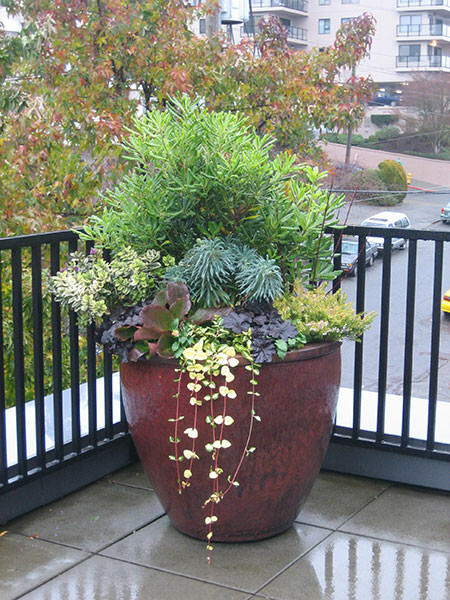 When doing an installation, even though hauling soil, fertilizer and plantings through the condo to the decks, there has never been the least little sign of her presence-with the exception of the lovely pots. 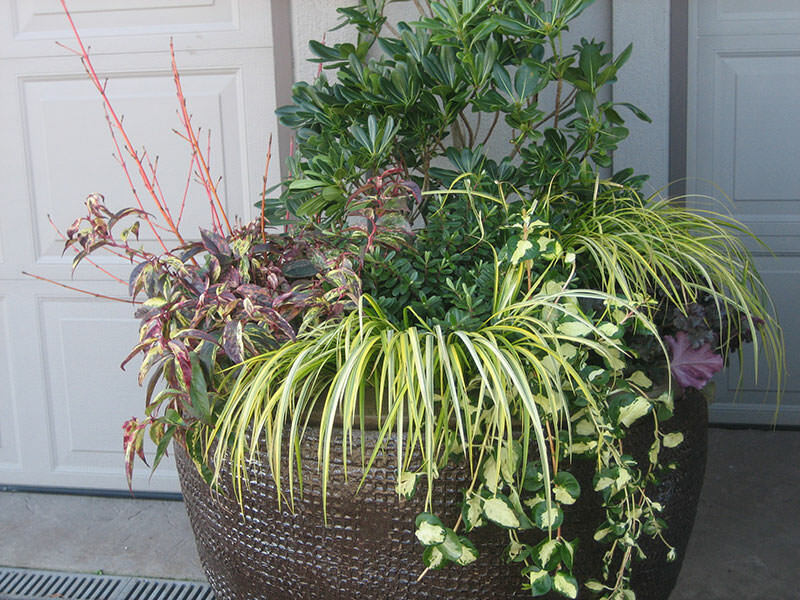 Obviously, we highly recommend Toni and Seasonal Color Pots!” Read more Houzz reviews here.